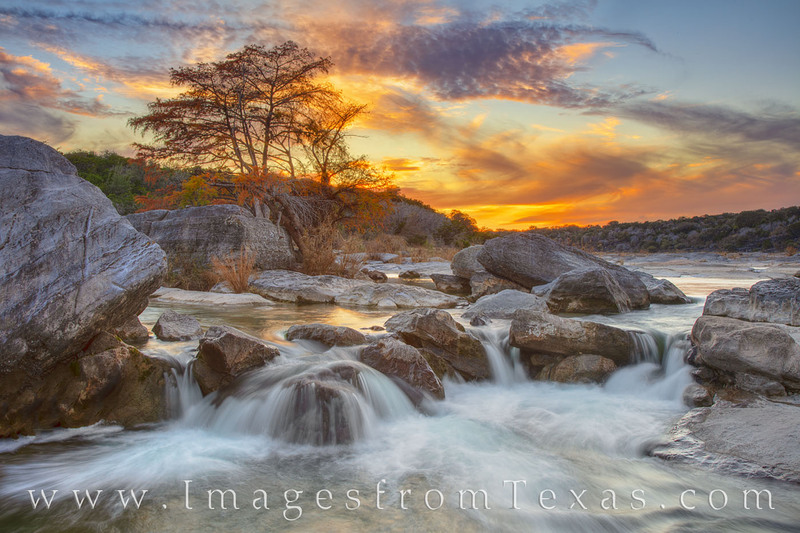 One of my favorites from the fall of 2018, this Hill Country image comes from the solitude of the Pedernales River. After wading through several portions of the river - and the water was quite cold after a few nights of below 30 degrees - and climbing atop a boulder to gain this view of a small waterfall, I clung to the rock for at least 45 minutes waiting for the sky to turn colors. At last, my patience paid off. The water tumbled over the rocks and surrounded the boulder I was perched on, and above the cypress tree in full Autumn color, the sky turned orange and purple and blue. My toes eventually regained feeling, and this sunset with the beautiful foreground was one I will remember for many years. Photo © copyright by Rob Greebon.